Do you know that old song "January" by Pilot? I have it stuck in my head on a permanent loop. Mainly thanks to the fact Mr. M walks around the house singing it: "January, sick and tired you've been hanging on me". And that pretty much sums up January, it hangs on you, like a grey coat you can't wait to shake off. As far as the allotment goes, January is a grim month. I'm not going to lie, we're mainly fair-weather visitors to our plot. Some hardy souls have dug over and fully prepared their plots by now. We're not in that league. This January has been mainly damp and mild, so we haven't had those crisp, sunny but cold days to get out and about. Yep, January, you've been hanging on me that's for sure. We took a walk down the allotment last week on a grey Sunday afternoon. Sometimes you just have to get out whatever the weather is doing. The allotment is in a sorry state. The battered old shed is leaning more that the Tower of Pisa, the grass has crept in and taken hold again, our purple sprouting broccoli looks moth-eaten and it's all a bit dank to be honest. 1) January is nearly over. Spring is getting closer. 2) It's 8 weeks until the clocks go forward and we get lighter evenings again. That means some precious after-school time on the plot with Magoo. 3) February means digging and preparing the plot. It's pretty cathartic, sloughing off the Winter drabness and turning over fresh soil ready for Spring seedlings. 4) This is a good time to give the plot an overhaul. Mr. M wants to make some raised beds out of recycled wood and we probably need to pull the sorry-looking shed down. 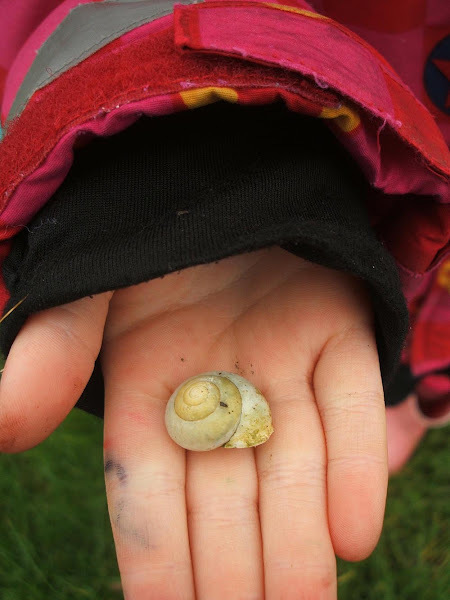 5) Magoo found a pretty, empty snail shell. Which is exactly how I like my snail shells - vacant. Slimy things. 6) Pleasantly surprised the leeks are still growing. They looked liked chives when we put them in, so didn't really expect them to cling on. 7) It's soon time to start planting some seeds. One of my favourite gardening activities. 8) We always try to grow something new each year. So we'll have to think about the crop we'd like to try in 2016. 9) My Mum has started to chit some potatoes already. Eating new potatoes that have only been out of the ground a short while is one of Summer's best foodie treats. 10) Did I mention Spring is nearly here? If you've got an allotment, you might want to see some of the jobs The National Allotment Society suggest you do in January. It doesn't mention sitting on the sofa, eating chocolate and looking at seed catalogues...but it should do. And if you've never heard the Pilot song, here it is. Think of it as my gift to you! I like Winter but once it's January we're the wrong side of Christmas and I want Spring to arrive so I can get out in the garden. We really need to spend some proper time at the allotment but the weather has been so awful lately. Growing something new every year is a good plan. Only 8 weeks until the clocks go forward - that sounds good to me! Empty snail shells are pretty - I'm not keen on occupied ones either! Good luck with deciding on your crops for 2016 and getting the allotment dug over - reminds me I really should try and get out and do some work in the garden before spring! 8 weeks until the clocks go forward sounds good to me - I always feel January is a bit of a drab month. Empty snail shells are pretty - I'm not keen on occupied ones either! 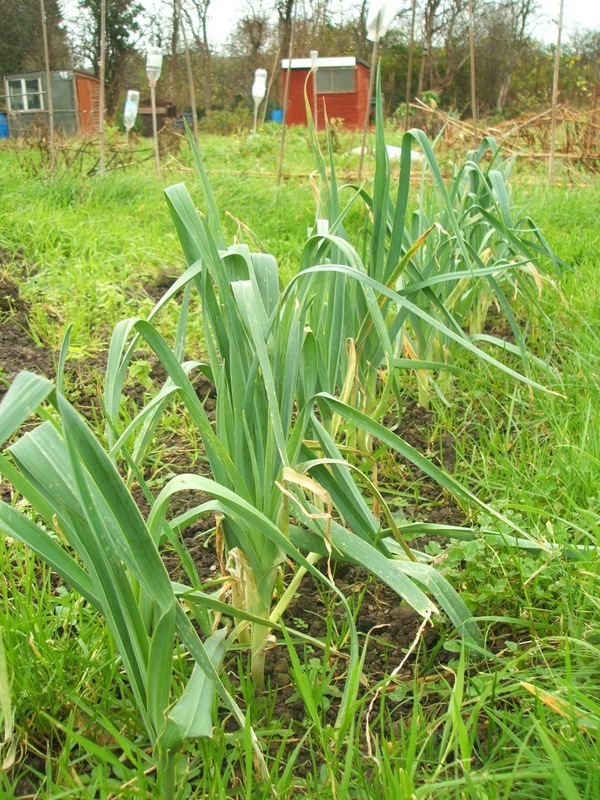 Good luck with choosing your crops for 2016 (glad the leeks are hanging in there!) and with getting the allotment dug over ready for spring. Spring cannot come soon enough I say, totally agree with you, roll on. There's nothing motivational about rain and cold to get me out in the garden ha ha. Thanks for joining in pickle! so looking forward to the clocks in the uk going forward an hour, will make it so uch easier to keep in touch with family and friends with only a 3 hour time difference, have you decided what 'new' crop you'll be growing this year? Would love to hear some new crop suggestions...what's worked for you and what hasn't! I was thinking of maybe trying some new beans. I've never grown Berloti beans and I heard Monty Don raving about them last year. Someone told me that Tomatillos are easy to grow too. But not sure I can handle eating green tomato-like crops, they need to be red! I love your positive list and as the sun is out today I am just about to head out to my veg patch to try and do some catching up. I am exactly the same, February is going to be a lot of digging at the plot. I wish I had an allotment.. although like you I'd probably not do much in January! Roll on Spring! I would definitely be a fair weather visitor too. I am not one for wet or cold weather! It must be so lovely to see everything growing that you planted yourself. I cannot wait for spring this year, it has been a rather wet and muddy winter. Glad to know it's not just me who hasn't started doing anything on the allotment. I really want to start digging over, but the weather has been awful and we haven't had time to get down yet. If this week is ok weather wise, I'll take the boys down and start digging, just have to lug the spade the 3 miles the too! Hope I don't look to dodgy walking along with two kids and a heavy spade! Will have a look at the link thank you, although I imagine we're probably a month or so behind with frost dates, so have to wait a while longer for planting some things. Your allotment looks great, the leeks are fab, we have some in the garden, but don't look as good!